Everything on Friday night's episode of "Fringe," from (yet another) changed opening sequence, to Henry Ian Cusick's performance, to the sight of an aging Broyles - and yes, a glimpse of William Bell (Leonard Nimoy) - was as perfect an episode of television as we've seen this season. I can't say I followed every single thing in the episode, which took us to 2036, in a world ruled by the Observers - but then again, the "Fringe" mythology in general literally needs multiple timeline charts to explain, so I didn't mind. This was as gripping an episode as we've ever seen. Etta and Simon, two fringe agents, plotted to bring back Walter Bishop, who was frozen in amber. This, of course, goes against the belief that the original fringe division, in the original universe, was purged, along with many others who didn't become "loyalists" to the Observers. When Walter was unfrozen and asked, "Do you have anything to eat?" I got chills! Unfortunately for Etta (who bears a striking resemblance to Olivia Dunham) and Simon, Walter was not the savior they hoped for. His brain was severely damaged, even more than it already was, after being frozen. Even so, he was able to repair Nina Sharp's mechanical hand, and they were able to recover a piece of his brain. Suddenly, it's a more take-charge Walter than we're used to. One of the Observers caught on to their plan and a chase ensued with Broyles joining in – who realizes, via a piece of licorice, that Walter is back. Soon, Walter, Etta and Simon come upon the fringe team, frozen, including William Bell – whom Walter abandons, save for his hand, which they will need to get through security for the next phase of their mission. Astrid and Peter were brought back, same as ever, but it appeared that Olivia is dead like the Observer predicted earlier this season. However, Peter's return was because of Simon's sacrifice, and now he is frozen in amber. No, Desm... I mean, Simon! Then came the moment we all expected might happen. Etta asked Peter if he recognized her. Slowly, he understood: This is his daughter. An extraordinary performance by Joshua Jackson, Georgina Haig and Michael Giacchino's score at that moment. I won't lie, my eyes were welling up. If the rest of the season comes even close to this, I think "Fringe" has made its case for a fifth (probably final) season. 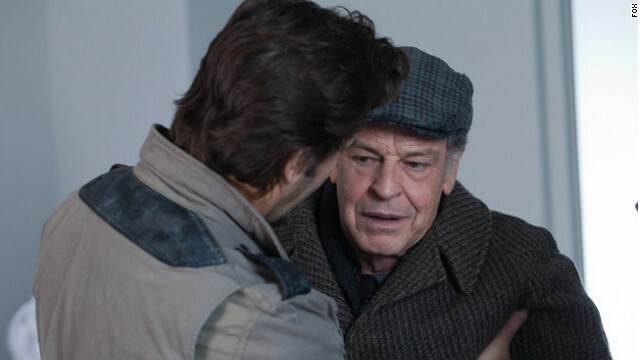 Were you as blown away by this week's "Fringe" as I was? Share your view on video or comment below. Also, the future episode of last season cannot be in the same timeline as the recent one. Liv and Peter talked about having kids, but she died b4 they had kids in last season's episode. In this season's episode, Peter and Liv obviously had a daughter.. different timeline.. plus no mention of Walter being in prison for a extended amount of time. Plus last season's timeline should have been erased when Peter fixed it (than disappeared) Which I found confusing because if Peter was out of the timeline (or rather drowned instead of being saved), than how could the machine be turned on to save both universes??? Question: Are the Observers a better constructed version of the defective Shape-shifters who were trying to improve human existence? Time travellers don't normally follow a policy of mass-murder of their distant ancestors. Yet, the observers who take over in 2015 don't appear to be concerned that their actions in this universe will rewrite the timeline and erase their future existence. The only explanation would seem to be that the invading observers are from the alt-universe, and that their actions "over here" won't endanger their existence in the future "over there." In all liklihood, they have also cut off access to the alt-universe to keep anyone here from interfering with their past. Love this show and loved, loved, loved this episode. It tied in wonderfully with the future-episode last season where Peter was attending Olivia's funeral and fighting a "resistance'. If Fox doesn't renew this show for next season it will be criminal! We do not need another "reality" show, or another forensic/cop procedural show. Fringe is intelligent, dramatic and just some of the best television out there. I'm still not sure if I made the right choice but I had to move on. Even though I was a devoted fan to Fringe I stopped watching when the played an old show in the second season making it appear as if the agent was still alive. It sounds like you guys are having fun but have to be careful to pick my fictional retreats carefully. Holy Toledo I thought this episode was fantastic and will be SO bummed if they don't have a 5th season....I enjoy all the episodes...everyone is too analytical....just go with it is the Best show on TV! If they stick with this storyline, one of the questions I have is: will Broyles be an official Loyalist, or will he take up the fight against the Observers again with the original Fringe team? He doesn't seem to be able to hide his thoughts from them like Etta apparently can, so it would either be a sacrifice on his part or he would have to simply leave his position and go into hiding. So excited to see how this series eventually plays out....please bring it back for another season! "Does anyone know or wonder why the Observers went bad in 2015 to begin with?" I remember something about the Observers from the future (some time in or around 2600) had finally succeeded in destroying the planet and making it uninhabitable. They decided, somewhere along the way, that the earth of the past was theirs for the taking and as they had the technology to do so, traveled back and conquered the earth of our time so that they could continue existing. This is one of the best shows on television right now. I've been watching since it first aired, and the stories are still entertaining and so original. I do hope it is back for another season. Fringe is the only serial drama worth watching on broadcast television. Excellent writing and acting, definitely not television for dummies. Great stuff! – It had better be back next year. This episode goes to were last seasons finally left us hanging. In last years finale when peter went to the future through the machine, he ended up in a roughly looking similar future where he was recognized as "the leader of the resistance" I believe. obvious now is why he was the same age in that future, because he was thawed from amber this past week. it is now the future that peter lives in that he must fight the observers in order to bring the universes back in order. Great episode! I was on the floor laughing when Walter was being escorted to the city and said to the guard "these are not the droids you're looking for." I really hope they come back to this story line at some point. That was the best line of the entire series! Loved the episode. If might have been a one-off but I hope they resolve the timeline and eliminate the Observers. It does make me wonder how many shots the Observers would have to 'win'. Infinite? Two (at least two universes) more? Don't know, don't care. Great episode. And if Walter can take Peter over to another universe and make it work, there are a lot of other possibilities out there. I know I've said this before but if Fox drops this show, I will never go back. I kept that promise with Showtime (Odyssey 5) and I'll do it again. I loved it. I kind of knew that Etta was Peter and Olivia's daughter from the beginning of the episode but it was still a great episode. I was almost disappointed to see they won't pursue this story line next week but it leaves something for next season. You may want to call it "Fringetastic." I'll admit, I figured it was Peter/Olivia's daughter from the jump. She (Etta) just screamed "I'm little Olivia" within the first 10 seconds of seeing her. Aside from that, it was almost criminal they saved this good an episode to this late in the series (Only what, 2 episodes left?). Once Fringe goes away, my DVR will be sadly empty for Friday nights. As much as I've loved Fringe, I worry it may have been too much of a thinker for the reality TV-loving mass audiences. At least we all enjoyed the ride though. This episode frustrated my whole family, especially the abrupt ending. We loved Walter, as we always do. I'm holding out hope that this episode will tie in to something later on, but I'll be watching to the end! My understanding about why they plan to stop after five years is that that is the cutoff point for royalties. If they go beyond 5 years, they have to pay the cast royalties for reruns. IMHO that is a lousy reason to end my favorite show ever! Actually, I think it's the opposite...they are fighting to reach 100 episodes so they can syndicate. Y5 may be the last because of the cost of producing the show vs the ratings it gets. It's JJ Abrams. Of course the epi ties into the greater mythology. Was it just me or did next week's previews pick up were we last left off and just leave this episode hanging? I suspect we will not see how this story in 2036 ends but I hope I am wrong. The ppl at work like this show. I regret not checking it out. Then rent them and catch up! This is one of the BEST shows on television. Can't wait for the next episode to explain the reappearance of William Bell ! Also will they manage to get rid of the Observers eventually ? Please, let there be a Season 5 to wrap all this up in a nice bow next year. I just recently discovered this show when I read that Fox was contemplating taking it off. Now I'm hooked. Can't wait to go back and watch the first 3 seasons this summer. As for those who think it's unlikely for the Observers to use the Fringe team to police the populace, almost every conqueror in history has used native surrogates or collaborators to keep their subordinates in line. Furthermore, when you're dealing with future alternate realities, anything is possible. @MuddyWolf: Season Two, Episode 1 has the best special effects scene ever with Olivia. You'll know it when you see it. I almost turned the TV to DVD – But the edgy show hooked me right away. The most original SCI-FI currently on TV. I hope it does not go the way of Firefly. Keep this SHOW GOING, Love it, Going to go get all of the Back Shows on DVD. They only could have made it worse by making everything claymation as a musical episode. Can I get a refund on my time? Claymation is awesome. Youust be a troll. I'm with you "not impressed" I thought it was stupid. I have watched every minute of this show from the beginning of season 1 and have put up with some of the stunts they have pulled before, but this one takes the cake. Made no sense particularly since they are going back to the present next week. How could they have possibly thought that this episode earns them a fifth season? I am so glad I found Fringe in it's early stages and I've been hooked every since. The DVR make's sure I never miss an episode. I am definitely not ready for this to end. Please, please, please keep this going. The show is so creative. I'm a little surprised by the positive reactions I'm seeing here. This episode was sub-par, but worse, it's the beginning of a signature JJ. Abrams spiral into nonsensical television. His shows start out fantastic, but after a few seasons he loses control. This episode had little bearing on the show's storyline, which only recently recovered from the "Peter's in the wrong timeline" thread that took up the first half of this season. Second, this waste-of-space episode didn't even make sense. Why would the Observors suddenly become womanizing facists who drink water out of flasks and need Fringe division to police the populace? It's silly. J.J. Abrams resurrected a dead character with no explanation for the last episode of Felecity, he bungled the end of Lost, and now he's going to let Fringe go down the toilet. For the first three seasons, this was the best show on television. Now it's surviving on the good writing that preceeded this season, and the great acting of the cast. At this point, I don't think Fringe can be saved. are the words, "jumping the shark" out -dated? . it is almost like what other shows do when they are tring to make a spin-off. and Bell? what the?howthe?where the? but for me, no why the? dont care he is dead stay dead. What I don't understand is how The Observers could spend centruries studying us only to need our help governing us in the future... I thought they were highly intelligent beings. I feel like the producers think we the viewers either do not understand what is going on, or forget what happens season to season. It's Lost all over again. I was a huge fan of Lost until they went so far in the deep end they couldn't get out. Fringe is headed the same way. If they spent as much time following the plot line as they do creating new intros to each episode we would be on the right track. Dear stupid: JJ Abrams isn't even involved with Fringe any more. He merely underwrites the shows, creates the original idea and then different showrunners take over. Of course it was a diverge from the original story line, it is the future and I am guessing it was a classic foreshadowing episode that will be tied into later in the normal series timeline. It was an awesome episode and I think all the long time fringe fans would agree. But at least they have gotten out of the Peter alternate timeline problem that I do agree plagued a bit of the first half of this season. Phenomenal episode – proving once again that the genius of Fringe is not dead and that the show should go on. Why so quick to dismiss it anyway? I love the episode 19 arc each season, in preparation for the next season. Love it, love it, love it...PLEASE keep it up. I, too, feel that Olivia will make a re-appearance. After all, how could they possibly keep the amazing and beautiful Anna Torv off the screen? She deserves more screen time. To you, the writers – great job! We are here with you. Watching Fringe is like sipping Cognac and tasting fresh homemade Vanilla Ice cream with creme de menthe drizzled over it with cherry of course! Slight correction to your review – the gorgeous, haunting music for FRINGE is written by Chris Tilton. Michael Giacchino wrote much of the 1st season's music, then handed the reins over to Tilton. I agree about the rest of the review – it blew my mind, and Joshua Jackson's brief appearance stole the show – he broke my heart. Yes. Thank you. I am tired of Chris Tilton not getting the credit he is due. He has written ALL the music for Fringe since the end of the first season. Michael Giacchino's name is only on the credits for some kind of contractual reason. Fringe is indeed the best show on television. It is creatively designed and meticulously presented. Congratulations to Fox for its foresight in beginning this series. Now it is time for Fox to step up to the plate and renew it for next year! First time ever to write into any blog about a TV series... But we all know this is not just ANY television series. While I struggled to watch the first half of this episode as I was a little frustrated with the fact that Olivia and Peter were (finally) really back together and now a new plot line emerges without letting all us Fringe fans enjoy the moment in relative peace for at least a little while, the second half kicked in with the action and new plot twists. It was a little obvious early on that Etta would be the daughter of Olivia and Peter, it was still a touching moment at the end. And while September did mention Olivia dying, the terrible thing William Bell did to Olivia does not necessarily mean she is dead. The great writing team surely has a creative and inventive manner to bring Olivia into this plot line to be reunited with Etta, Peter and Walter (I am wondering why Etta did not mention to Walter that she was his granddaughter.) I agree with all above that Fringe deserves a fifth season and I definitely concur that this should be its final season – for the only reason to keep the writers focused on giving its loyal fans answers to the number of questions still hanging out there. I hope Fox and CW listen to its fans and give us what we ask for. Still, if the networks want to go on indefinitely, I would not mind in the least. "My impression was that she didn't realize Peter was her father until the end, when they were on the train." Really? I got the opposite impression from the beginning of the episode....the way she was constantly asking about "the team" and how she seemed to get somewhat giddy when the thought of them still being alive and able to rescue became clear. Obviously not the most popular show on television, but is there a better one? Mind-bending plot twists (even if Etta as daughter seemed a bit obvious) and superb acting. Nice to see a hint of William Bell, even if Nimoy-free. Got to have some kind of season 5 – c'mon Fox and WB, work something out, you still owe us one for Firefly. EXCELLENT episode! I can't believe they started yet another story line thread so late in the game though! I would just like to take this time to brag that I was correct about Peter being home the whole time several weeks ago in this blog! I don't know if anyone here actually, regularly frequents this particular blog, but did I call it or what? February 27, 2012 @ 8:47AM! Wow! Didn't realize it was that long ago already! This episode was terrific and proved that there should be a future for FRINGE. I could not hold back tears when Peter realized that Etta was his daughter. Loved it! I can't believe they would even think about taking this show off the air. One of the best programs on tv. This plot line could go in so many directions. Last nights episode proves that point. Great episode. I look forward each week to watching it. Awesome episode. One of the best shows on TV.